Located in an isolated area in Pantai Kok, formerly Sheraton Langkawi Beach Resort (now Century Langkawi Beach Resort) offers luxury stay by the beach side, although conveniently located close to some of the top attractions of the island like Cable Car. You will likely choose this hotel not just because it was earlier part of the Sheraton brand, but also because of its tropical and serene landscape of 38 acres, nice amenities, secluded beach and of course very courteous and friendly staff. 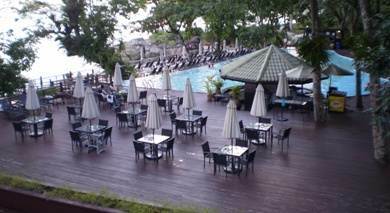 I have been to this resort several times during our many vacations in Langkawi over the years. And over time I have noticed couple of developments - one quite positive and the other a bit negative. I have noticed that in recent times the staff behavior and attitude towards guests have vastly improved. They are much more friendly and forthcoming than they were earlier. The service is offered with a smile and enthusiasm. That's the positive development. However the hotel shows some signs of being worn out and need some upgrades, specially in the rooms. Some of the pathways and amenities like the tiles at the swimming pool need to be better maintained. Hopefully the management will soon take care of this. But overall it remains a very pleasant experience here. With the natural environment surrounding the resort, the tropical gardens and the water views, we have always had a good time here. If you are finicky about perfection and spotlessness, then this resort may not be for you. It's a little laid back. Due to its location and surrounding flora, there will be some leaves falling on the pathways and may even be coconuts. You need to be a bit patient waiting for the battery operated shuttle cart to come, pick you up and drop you at the point where you want to go within the resort area. The service may apparently seem a little slow. About the private beach of the resort .... it's known as Batu Hampar Beach, a small tiny stretch of sand (some 25 meters) with rocky formations at its two ends. Although the resort claims it as private, it is actually a public beach. But you won't see any outsiders here due to the all encompassing presence of the resort. Although there are lounge chairs and umbrellas laid out on the beach, we seldom found anyone there. But the forested land areas and tropical gardens invite many small and amazing animal life in the resort area. You will surely see monkeys and monitor lizards. Sometimes there could be some problems of mosquitoes & bugs. Notify the staff and they will take care of that. There are some 238 guest rooms in the resort area of several types. There are rooms in small blocks, suites and cottages. All rooms and accommodations have French windows and private balconies that are designed to offer great views. 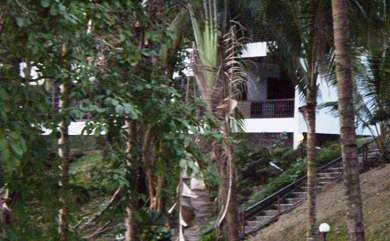 The Superior and Garden View rooms offer view of the tropical gardens of the resort. And there are Partial Sea View Rooms, Sea Facing Rooms with Jacuzzi bath tub, and Sea Front rooms overlooking the sandy stretch and the sea beyond. The in-room amenities include high speed internet access (chargeable), dual line phones, air conditioning, LCD TV with free in-room movies, personal safe, day bed in the balcony, chaise lounge, iron & board, coffee & tea maker, mini bar etc. The suites are huge (104sqm) having two lounges, private balconies etc. The resort offers quite a few options when it comes to dining and wining. 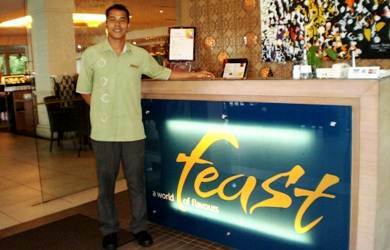 Feast is an all day dining restaurant offering Asian, Western and Fusion cuisine. You get a nice tropical garden views. 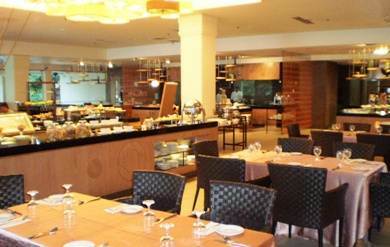 It has interactive cooking stations and options for both ala carte and buffet dinner. Open from 7am until 11pm. 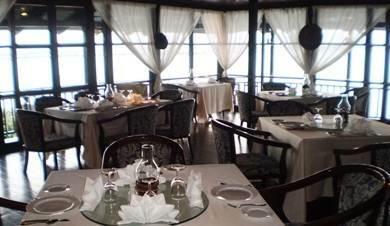 Captain's Grill is a fine dining restaurant with its interior simulating a sail boat ambience. It offers great seafood & grilled specialties in al fresco style and has wonderful view of the ocean. It's open only for dinner (6:30pm until 11pm). Spice Trader is a beautifully themed Asian restaurant offering magnificent view of the ocean. You can have a unique dining experience while relaxing on rugs & pillows. It's open only for dinner (6:30pm till 11pm). Chime is one of the most popular bars in Pantai Kok area. With DJ playing all kinds of music, the bar comes alive in the evening. The bar is patronized by many affluent locals. It has both inside and outside seating areas. Check out Pantai Kok Nightlife for more information about the Chime bar along with its pictures. There is a Pool Bar which serves nice snacks and drinks. It's a great place to enjoy a cocktail during the sunset while enjoying the pool ambience and the views of the ocean. 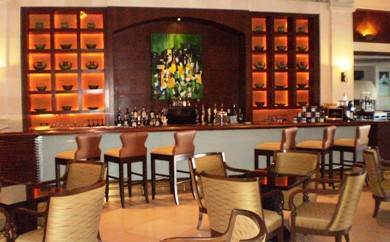 The Lobby Lounge offers snacks and beverages. You can also engage in board games here or read some magazines or new papers and relax. The lounge is WiFi enabled. Century Langkawi Beach Resort offers several activities and amenities for the guests. The Spa is set up in a tropical garden against the backdrop of the sea. Based on Balinese (Indonesian) massage techniques, it offers many different massages, body treatments and facials. It also offers Chavana massage. The Spa property has a tranquility center, garden shower and outdoor Jacuzzi. 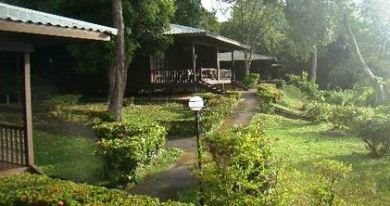 For children, the Lutong Kids Club offers different activities like batik painting, picnic, nature walks, treasure hunts etc. The Tour Desk offers a range of sightseeing tours including Island Hopping Tours, Geopark & Mangroves Tour, Snorkeling & Diving trips, Golfing tours and more. But as expected, charges are much higher compared to any standard tour operator. The outdoor Swimming Pool is really nice and has lots of space and sundecks around it for lounging. Other amenities in the resort includes Sauna, Volleyball, the private beach (although quite small), bicycle rental, outdoor tennis courts, table tennis, business center, five meeting rooms etc. The resort is located on the western shoreline of Langkawi in Pantai Kok area. It takes about 15 minutes to reach from the airport by car.